Got back from Christmas and New Years. It was a difficult holiday as almost everyone ended up with flu. My brother did not; he lives in Shanghai these days, working as a financial consultant. A few things he said I thought were of interest. American restaurant service. “You can’t get service like this in restaurants in China.” That led to the discussion of new immigrants (or in the crude vernacular, fobs), and how long term residents of San Francisco’s Chinatown feel about them. American serving size. “The biggest in the world.” The size of Americans surprised him, after all the years overseas. 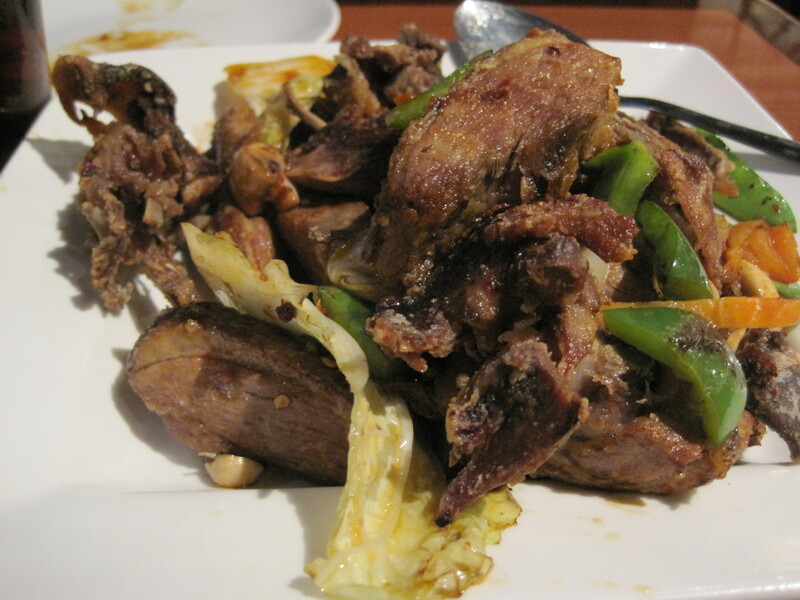 The diversity of ethnic Chinese foods. 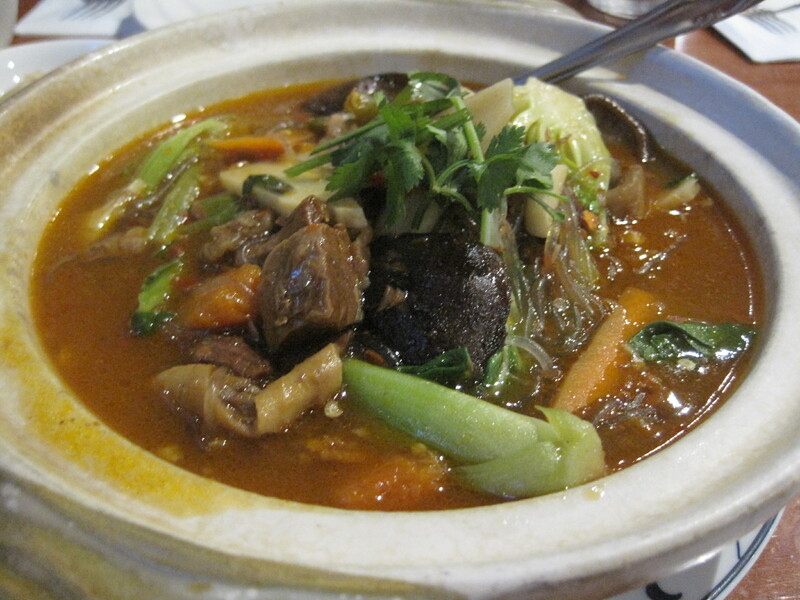 He’s very fond of Xinjiang cooking – western Chinese cooking, from the Muslim provinces. “You can’t get that kind of cooking in the states.” Northeast Chinese cooking has a lot of dumplings and noodle dishes. The food seen in the States is largely Cantonese. He was a little surprised at the Sichuan foods I could describe to him. He could name them once described. Not food related but interesting nonetheless: though China has a booming economy, there is still a lot of unemployment there. It’s hard to put 1.3 billion people to work. Cities of course, are huge. A city of 6 or 7 million people is a smaller city in China. 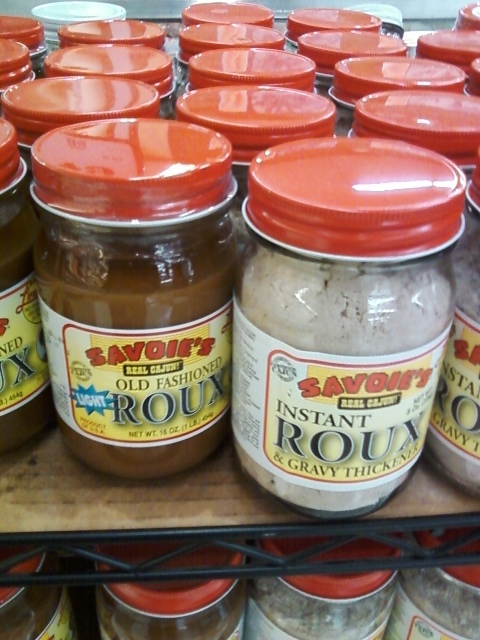 I’d never thought of canning a roux before. 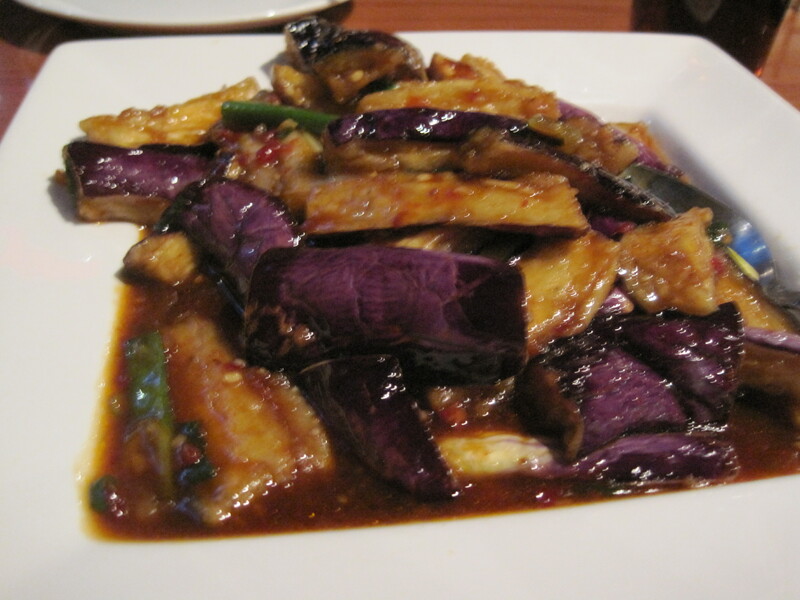 Locally, I tried these dishes at Fung Mei (yu xiang eggplant (i.e. eggplant with spicy garlic sauce) and shredded crispy duck) and they both were really good. 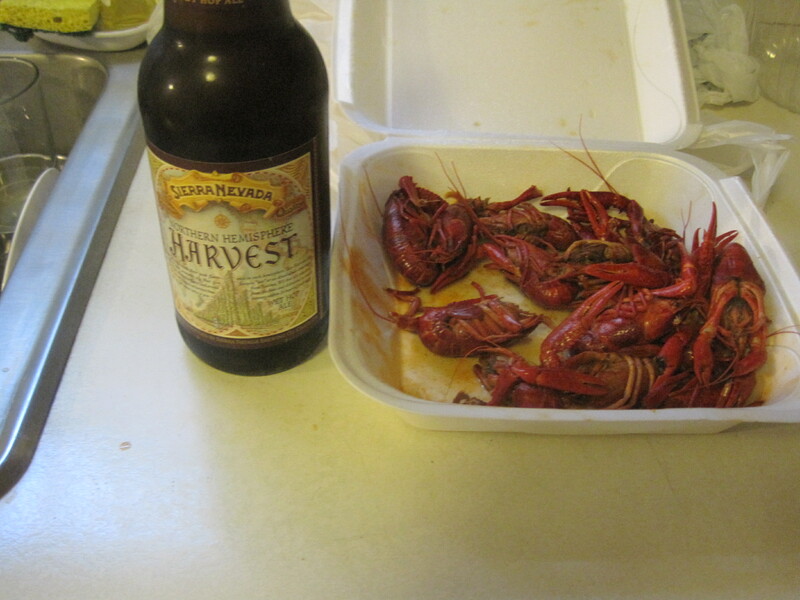 New Orleans Seafood is charming, in its own way. I’m delighted that Chow Down Atlanta found this restaurant, as there really is nothing like it anywhere near Snellville. 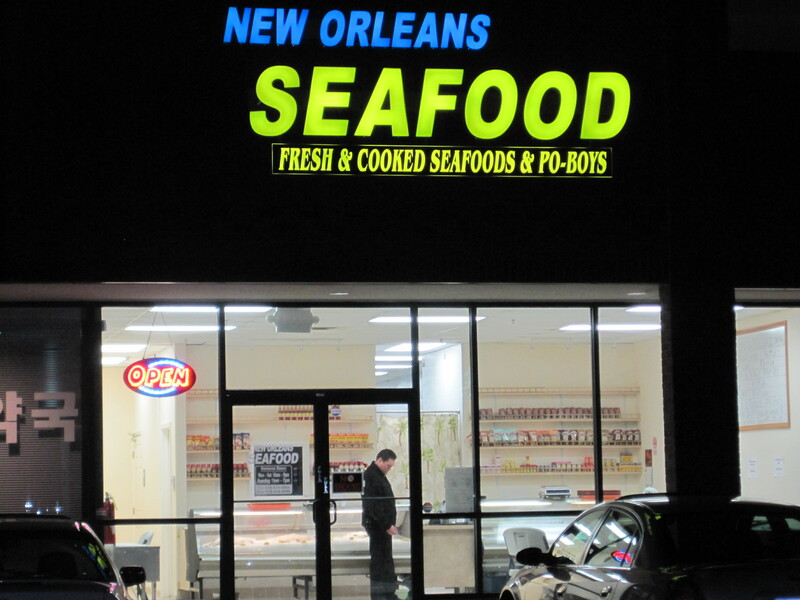 This is a small seafood store that also prepares food, and the owners are ethnically Vietnamese. As I entered, I couldn’t help but think about all the Vietnamese around Kemah, Texas in the 1980s, who were the most reliable and inexpensive source of seafood for anyone near Houston at the time. So to some extent, going to New Orleans Seafood feels as if I’m stepping back in time. The chef that makes the food go comes from the Mobile, Alabama area. Mobile was a center of Vietnamese immigration, as access to the sea gave these immigrants a way to make a living. 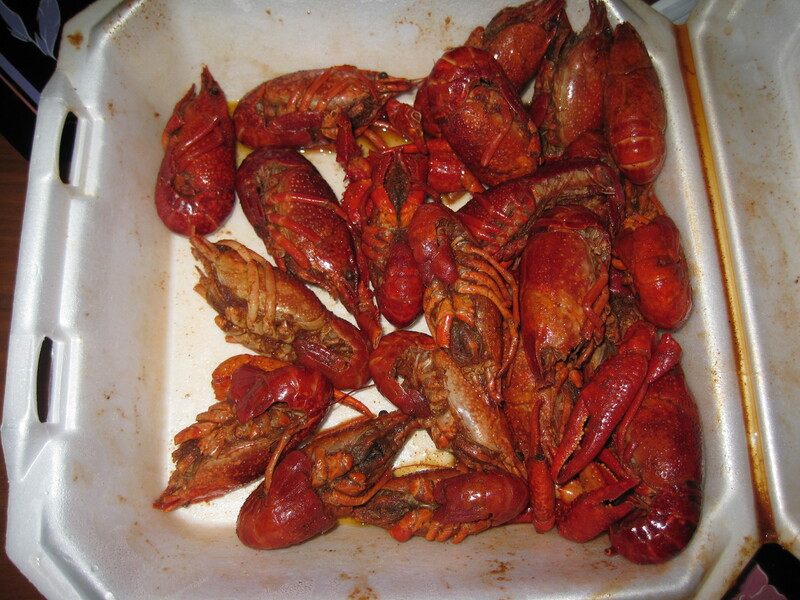 That same access to the Gulf also meant an exposure to Cajun customs and cooking, as Acadians range all over the Gulf. In the middle of all the excitement, I managed to order hush puppies, a boudin ball, a shrimp po boy and about a pound of boiled crawfish. 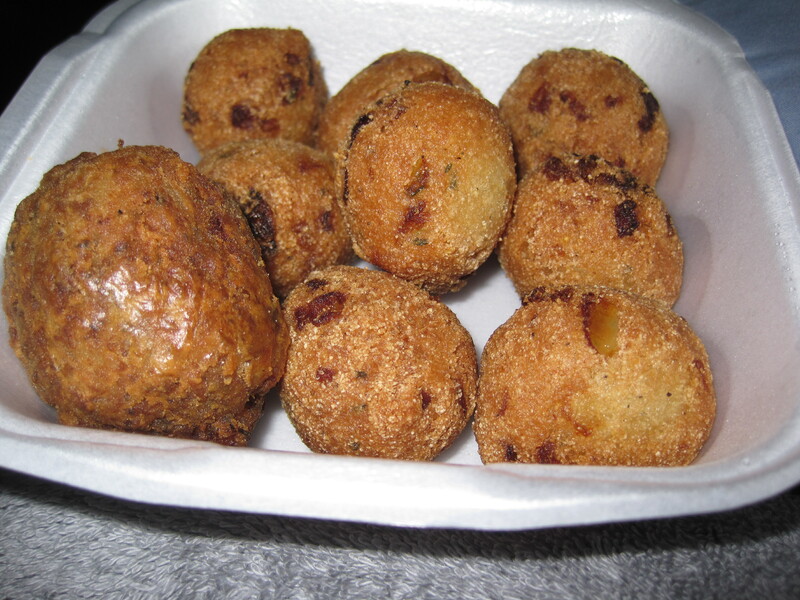 The big sphere is the boudin ball. After I entered and ordered, the lady of the eatery came out and ask how I had found the place. I told her I had seen this place on the Internet and she became so excited. Eventually I showed her Chloe’s web site and she started telling me about Chloe’s visit, how Chloe wanted to take pictures and all. 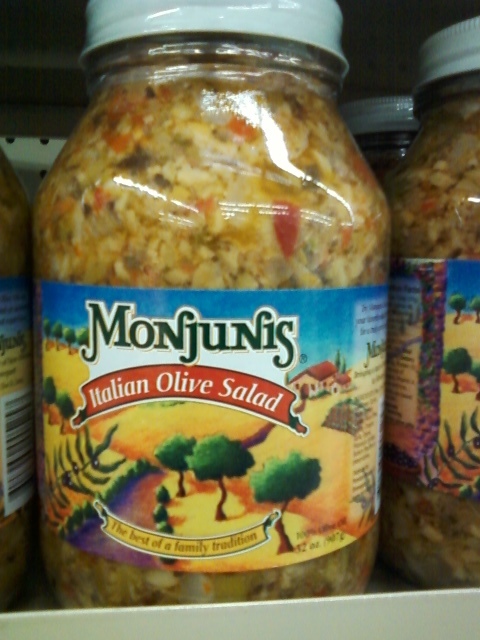 It left me in a bit of a quandry, as I wanted to take pictures as well. But the food was ‘to go’ so I ended up leaving and taking pictures when I could stop. 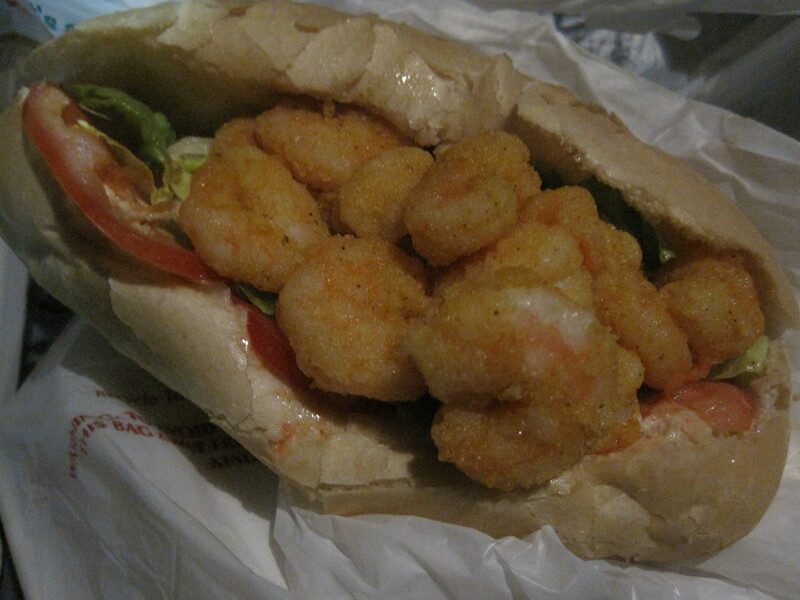 Verdict: Cajun seafood and dishes with a Vietnamese flair. Highly Recommended. 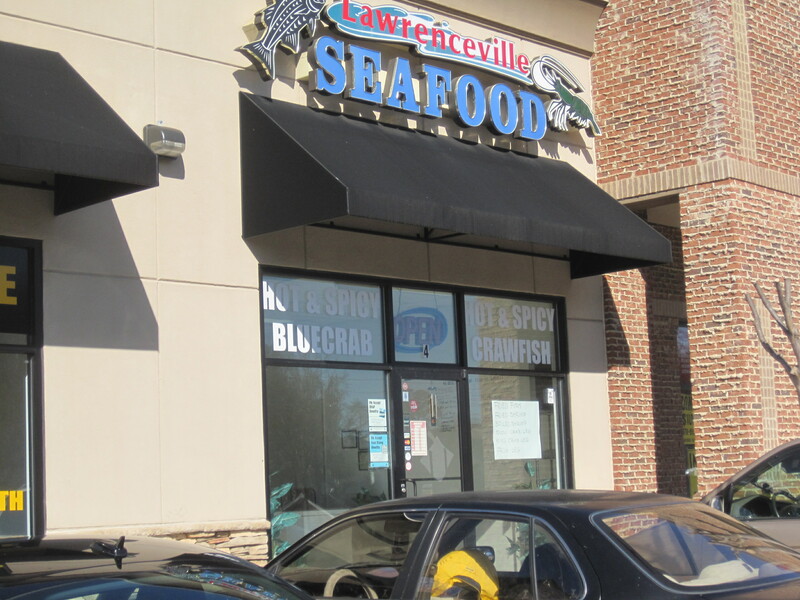 Delicious Kabob is a modest restaurant on Shallowford Road, just a bit north and west of the Buford Highway-Shallowford Road intersection. This eatery has been on the hit list of a number of food bloggers this year, including Jennifer Zyman, Jimmy of Eat It Atlanta, Amy of Amy on Food, and certainly not least, BuHi of Eat Buford Highway. My wife was complaining she didn’t hadn’t had any good Chinese in recent days, and I suggested this place, because it seemed it would be a little different and perhaps we’d find some new (and spicy) food. For some reason I thought it would be closer to the intersection than it was, and heading up Shallowford from the intersection placed Delicious Kabob on our left once we found it. It’s in a strip mall, and parking is plentiful there. Once inside, we knew we were going to get kabobs, and so we got the squid kabobs (on Buhi’s recommendation) and we also got chicken kabobs. My wife ordered a chicken lo mein dish, and my daughter their lamb stir fry. 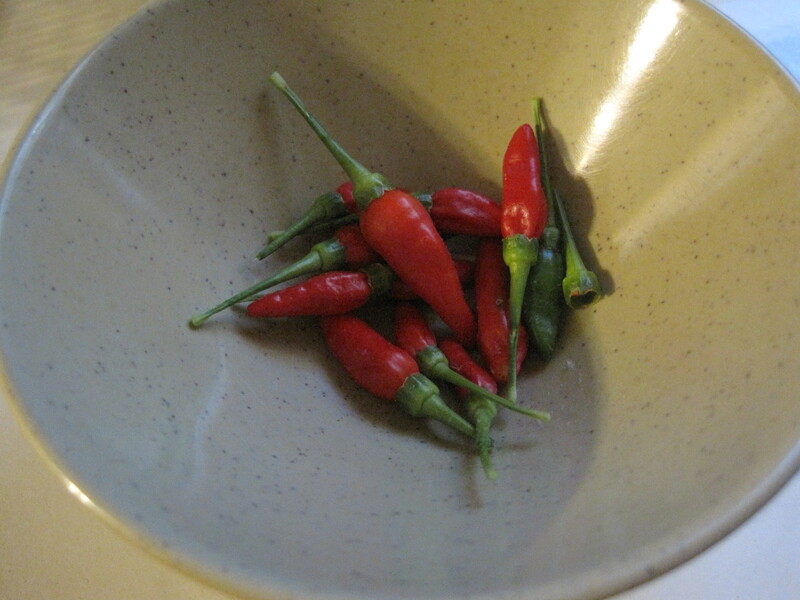 I ordered (based on Jennifer Zyman’s recommendations) the Szechuan crispy fried beef with chili and peppercorns. The crispy fried beef was the hit of the meal. The cost of the meal, given the serving size, has to be regarded as inexpensive. Each of the entrees could have fed two people easily. That some things worked and some things didn’t is manageable. Trying to get both squid (must be cooked quickly) and chicken (should be allowed to cook thoroughly) kabobs is a mistake we simply won’t repeat. The things that did work were so good we’ll be coming back sometime. The service was good for the most part. At the end our server seemed to forget we were there and we were left hanging waiting for a ticket. We eventually did get one, but on the owner’s initiative, not our servers. Verdict: Good Chinese food served in diet busting portions. Decent service. Highly recommended.